Everyone's seen these stackable plastic chairs, but did you know we could not have found one anywhere in 1962? It was under development that year, as various manufacturers tried to wed the curved, formed plywood furniture of the 1950s with newer, low-cost plastics. It was designed by Robin Day of Great Britain and first manufactured and sold in 1963. The design was named "Polyprop" and it's been estimated that over 14 million have since been produced! Just another measure of how our world has changed since 1962. This got me to thinking about furniture in general for 1962. What was available? What was new? Who was designing the new stuff? How was it advertised and where could you buy it? So, let’s try to answer some of these questions. First off, though the Polyprop chair was still under development, there were plenty of other curvy, one piece chairs for sale in 1962. I’ll discuss Eero Saarinen’s tulip tables and chairs below, but there were still more. The already famous Eames Shell Chair was released in a rocking chair version in 1962, by the Herman Miller Company. There was also a curvy variation on the overstuffed armchair, called the Papa Bear Chair, from Hans J. Wegner and A.P. Furniture. The arms were reminiscent of the recently ended trend of taillight fins on cars. 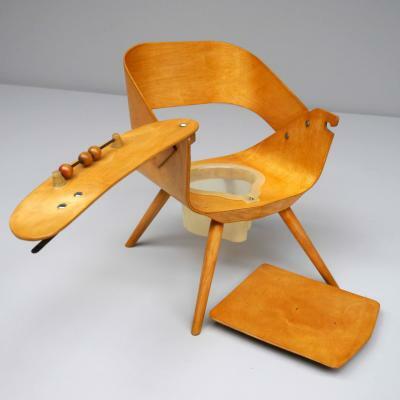 But perhaps the strangest chair I’ve seen that picks up on the curved aesthetic is the baby’s toilet training chair shown below. It’s a 1962 design made of curved beechwood by French manufacturer Baumann. Not only does it have the removable pot underneath, but it features a toy to play with while baby does his business. One way to measure things past is to look at what is collectible today. In mid-century modern furniture, one of my favorite blogs, Retro Renovation, found the following brands to be the most collectible. One factor they looked at was that vintage furniture was built to last, which means a lot of it is desirable because pieces are still in like-new condition after 50 years or more of daily use. Even upholstered pieces are still in demand because of their solid frame construction, though they may need reupholstering. Broyhill Brasilia – This line launched in 1962. Its appeal is in the swooping designs that make it instantly recognizable. These decorative details are based on the architecture of Oscar Niemeyer, who designed Brazil’s modernist capital city, Brasilia. Brasilia opened in 1960 and the architecture made immediate impressions internationally. Heywood-Wakefield – This company, founded in 1897, featured curving lines, solid wood construction, and a unique champagne finish. It has proven so popular that it is still manufactured today, in the USA, so you can buy new old-style pieces. The new furniture is still made from Northern Yellow Birch, the same wood used for their vintage furniture. Drexel Declaration – The principal designer of this furniture line was Stewart MacDougall, who expressed his design philosophy as, “…to create forms that are not fashionable so much as timeless.” Instead of the curves of Brasilia, the Declaration line is characterized by clean, straight lines and little ornamentation. This line dates to at least 1961, as seen in the ad above. Kroehler sofas – For decorating a retro living room, in any style including retro atomic, it is hard to go wrong with a Kroehler sofa. They were made with a durable frieze fabric, and in so many colors, shapes, and sizes that they match nearly every room. You can find them in one-piece, sectionals, squares, curved, with frilled skirts on the bottom, and just about any other style. Eero Saarinen tulip tables and chairs – Eero Saarinen is of course known for his stylish buildings and projects such as the Gateway Arch in St. Louis, Missouri and Dulles International Airport Terminal in Washington DC. But he also designed perhaps the most famous shape in mid-century modern furniture, the curved pedestal tables and chairs. He has stated they were designed to, “…clear up the slum of legs in the U.S. home.” First released in 1956, they are still popular today as both antiques and new production furniture. Magazines helped popularize new styles. Trend setters included House Beautiful, The American Home, and general interest magazines such as Ladies Home Journal, Family Circle, and Better Homes and Gardens. Even magazines like Popular Mechanics showed modern homes and furniture styles in articles on building your own home. The typical consumer bought furniture at a local furniture store. The only large chains selling furniture at that time were Sears, Montgomery Ward, and maybe Penney’s, and most towns did not have one of those stores. So local stores like Edwards Furniture Co. of Alice, Texas or Horning’s Furniture of Annville, Pennsylvania, both of which opened for business in 1962, were where you shopped. Some small towns like New Castle, Indiana even had several furniture stores at that time. These and many others thrived on the housing boom of the 1950s and 1960s, as did Godwin’s Furniture and Appliance in my hometown of Saginaw, Michigan. When they opened in 1948, they were so far out of the city that they couldn’t even get bank loans because they were considered a poor business risk! Like Edwards, they’ve since expanded into a small chain. Modern styles of furniture showed up in many places in 1962, including of course advertising. But even toys were influenced. 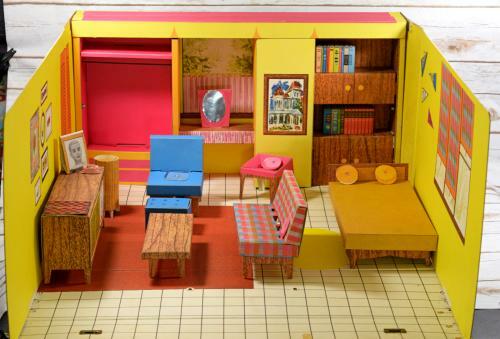 Mattel’s Barbie Dream House sold in 1962 featured cardboard versions of chairs, sofas, beds, dressers, and more that looked just mommy and daddy’s new furniture. The pieces were included in a fold-to-open cardboard box that looked like a modern ranch house exterior. Included were more details like record albums, clothes hangers, pillows, and a floor printed with a combination of floor tiles and carpets. Not doubt there were many hours of make-believe fun ahead for any girl who received this for a birthday present! For folks who wanted to save some money on furniture, or who needed a hobby, books were published on build-it-yourself modern furniture. Sunset Magazine published “Sunset Furniture You Can Build” in 1962, which featured 125 furniture projects including popular items like floating wall cabinets, patio furniture, chests of drawers, bookshelves and magazine racks, ottomans, a platform sofa, dining and kitchen tables, and even a Japanese style convertible garden. Designs were by some well-known designers of the day including Paul Kirk, who worked with Stewart MacDougall on the Drexel Declaration line, Alfred Pries, who designed the USS Arizona Memorial in Pearl Harbor that opened in 1962, and John Lautner, who designed many mid-century modern homes in California and was likely well known to readers of Sunset Magazine. Modern furniture also showed up in unusual places like postage stamps. For example, Romania released a set of 10 stamps showing Romanian handicrafts to commemorate a Sample Fair held in 1962. One of the stamps shows a curved chair and tulip-style lamp and another shows a tall vase that would have looked right at home with the furniture. You can find more about what appeared on the stamps of 1962 at the Roadtrip-'62 ™ 1962 – The Year in Stamps page.